Could your social media marketing efforts use a boost? Are you looking to improve your professional development when it comes to social media? Are there social networks you’ve been avoiding because you don’t have time to figure out what works? If so, Social Media Examiner has just the event for you. In this article I’ll share seven reasons you should attend the upcoming Social Media Success Summit. Why Attend Social Media Success Summit 2014? Social Media Success Summit is a live online conference spread out over four weeks—October 7, 2014 to October 30, 2014. The conference empowers you to use social media to gain more exposure for your brand, increase traffic to your website, cultivate more responsive audiences and grow your business. Watch this “behind the scenes” tour. These techniques give you tactics and latest techniques that will speed your path to marketing success. Still wondering if the online conference is for you? Trust me, it is. Here are seven compelling reasons you need attend Social Media Success Summit 2014. We anticipate that this year’s audience will be more social media–savvy than in previous years, so to keep up with your expectations, we made sure our content goes deeper and focuses on more intermediate to advanced tactics. Social Media Examiner founder and CEO Michael Stelzner and his team have recruited over 45 of the world’s top social media marketing experts to share their best advice at the sixth annual Social Media Success Summit. This year’s summit offers more amazing content than ever before. With 33% more sessions than last year, you’ll take away actionable tips for your social media marketing. And you’re guaranteed to learn something new that will inspire you. Ever since businesses started using social media, the universal question has always been, “What is the value of all of this activity?” or variations of that question. 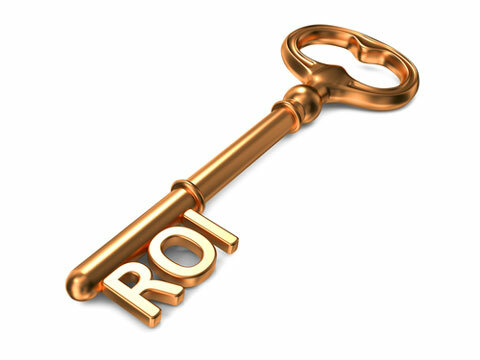 Learn the keys to measuring your ROI. Image: Shutterstock. In fact, the latest Social Media Marketing Industry Report indicates that social media measurement is still a thorn in the side for marketers across the board. For that reason, the summit features five sessions dedicated to the different aspects of social media measurement, ROI and analytics. To address this ongoing challenge, Nicole Kelly (author of How to Measure Social Media) and her co-presenter Arsham Mirshah (a master at Google Analytics) will talk about measuring ROI with Google Analytics. Acclaimed authority in social media measurement Chris Penn will go deeper and offer insights you’ve probably not heard of before. Ian Cleary will talk about the most helpful tools for social media measurement and analytics. So no matter what your struggle with social media measurement, you’ll find valuable information to point you in the right direction. Just a few of the featured presenters you’ll learn from during SMSS14. As always, we’ve retained the top social media experts to teach the sessions at Social Media Success Summit 2014. You can expect to hear from your favorite speakers such as Mari Smith, Kim Garst, Mark Schaefer, Pat Flynn, Jay Baer, Amy Porterfield, Lee Odden, Viveka von Rosen and other pros you’ve come to respect. And many more new faces! Learning directly from pros significantly reduces any trial and error in your social media tactics. Since these pros have already paid their dues and learned from the ground up, they share what works and what doesn’t. You end up with solid tips to reduce your learning curve. Here’s a quick story that illustrates how the summit can help you do your job better: I work as the social media manager for US Pharmacopeia. A couple of weeks ago, I was trying to figure out a more efficient way to leverage Facebook ads. Having little experience with Facebook Power Editor, I was really struggling to figure out how it could help me. After a lot of trial and error, frustration and wasted time, I discovered an excellent article by Jon Loomer that explains step-by-step how Power Editor works for Facebook ads. That article was a great find, but I know hearing Jon Loomer in person would be even more valuable! Well, Jon Loomer is one of the instructors at this year’s summit, and he will be presenting a session called “How to Succeed with Facebook Advertising.” If you’re wondering how to deploy a new tactic for Facebook advertising, this is one session you won’t want to miss. Save yourself the headache of researching and learn it straight from one of the best in the business. 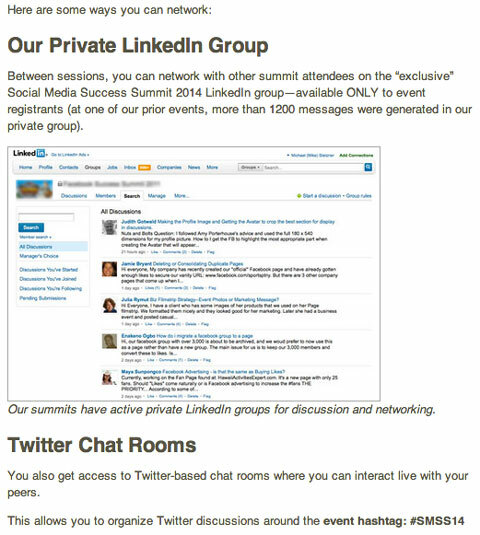 Between sessions, you can make valuable new connections in our private and exclusive Social Media Success Summit 2014 LinkedIn group—available only to conference participants—and chat live with other participants in our Twitter chat room. Take advantage of the networking opportunities. You can discuss the sessions, ask questions, talk to your instructors and generally network with like-minded professionals. The summit is designed to help you focus on individual themes. Each day focuses exclusively on one theme such as social media strategy, Google+ marketing, Twitter marketing or Pinterest marketing. With this format, you can choose which days are most relevant to your learning experience, depending on the social media platforms, strategies and tactics you use at work. Typically conferences like this cost thousands of dollars because of travel expenses and lost work time. But Social Media Success Summit 2014 is fully online, so there are no travel and hotel expenses. What’s more, you can keep studying the material for up to one year from the date of your ticket purchase—you can access all of the session recordings and transcripts so you can watch and learn at your own pace. When you attend Social Media Success Summit, you’ll be able to go back to your job, enrich your business and share the knowledge with others who didn’t get a chance to participate, which benefits everyone. 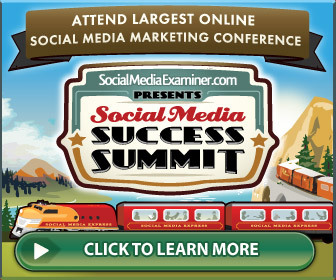 Social Media Examiner is really excited to present this year’s summit. 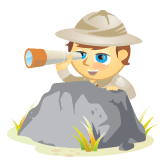 We realize you have matured in your social media experience and are at a much higher level than you were last year. We’ve prepared a conference that caters to you and takes your social media marketing to a whole new level. We hope you’re excited about the upcoming Social Media Success Summit! Reserve your spot now and save money. Click here for details on our current sale. What do you think? Are you excited about learning the latest social media marketing tactics? Are you planning to attend this year’s Social Media Success Summit? Leave your questions and comments in the box below. 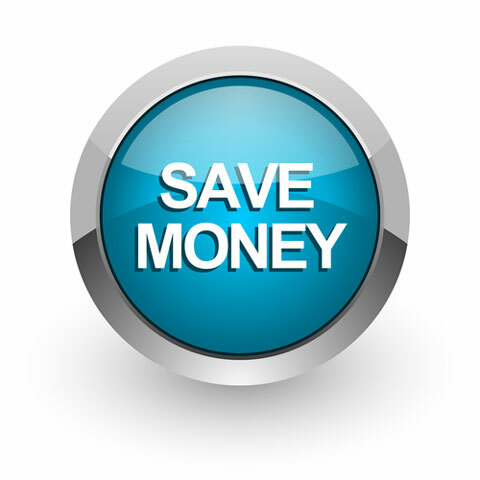 Save Money Blue Glossy Web Icon photo and ROI Golden Key on White Background photo from Shutterstock.